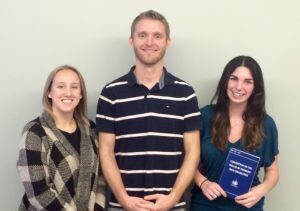 In our final semester as students in St. Thomas University’s School of Social Work we have partnered with the New Brunswick Association for Community Living (NBACL) to create awareness about the United Nations Convention on the Rights of Persons with Disabilities (CRPD). NBACL is a provincial non-profit organization that works on behalf of children and adults with an intellectual disability and their families. The Association’s mission is to build inclusive communities where persons with an intellectual disability can live, learn, work and play. The CRPD was created to assure that all people who have a disability have full and equal enjoyment of their lives within their community. With assistance from NBACL, we have created a plain language webinar series and presented a free family workshop to help people better understand the CRPD. Here is some of what we’ve learned. Ratified by Canada in 2010, the CRPD is an international agreement that specifically outlines the rights of persons with disabilities. The Convention also details a series of actions that governments should be taking in a number of areas to ensure that the rights of persons with disabilities are respected and preserved. Some of these include education, decision making, health care, employment and ensuring adequate standards of living. Through our research and experience at NBACL we have come to realize that many people are unaware of the CRPD and the obligations that it contains. With the International Day of Persons with Disabilities coming up on Saturday, December 3, we, as community members and future social workers, feel it is imperative that this revolutionary document become recognized and understood within all aspects of society. We believe that all persons are entitled to equal human rights regardless of ability or social standing, and that awareness of the CRPD and its principles is an important step to ensuring that people who have a disability are welcomed and fully included in all communities across Canada. While the CRPD recognizes multiple aspects of one’s rights, we are going to discuss four that, when applied, can have a real and tangible impact on the lives of children and adults who have a disability. First, Article 19 of the CRPD discusses living independently and being included in the community. Through Article 19, signatory countries agree that persons with disabilities have an equal right to choose where and with whom they wish to live, to have access to disability-related supports and services and to prevent isolation and segregation. Article 24 of the CRPD addressed education and states that persons with disabilities have the right to an inclusive and equal education, which means having access to the general education system and receiving adequate supports and accommodations within that system. In February 2016, New Brunswick received an international award for our inclusive education policy 322, in recognition of our province’s ongoing commitment to inclusive and supportive education. Policy 322 aligns closely with the rights stated in the CRPD and outlines resources and supports to facilitate full inclusion in New Brunswick’s K to 12 education system. Article 27 focuses on work and employment, stipulating that persons with disabilities have a right to work on an equal basis with others. This includes having access to work environments that are open, inclusive and accessible, and having the assistance that may be required to find and maintain employment in both the public and private sectors. Article 28 assures that persons with disabilities have the right to an adequate standard of living and to social protection. As a result, signatory countries have agreed to take measures to ensure access to supports such as public housing and poverty reduction programs. While New Brunswick has shown commitment to building inclusive communities, there is still a lot to be done to ensure that we are fulfilling the promise to uphold the fundamental rights of persons with disabilities at all levels. As future social workers, we will strive to keep the Convention on the Rights of Persons with a Disabilities a priority as we work with New Brunswick’s most vulnerable citizens. We call upon our governments, the media and all members of our society to recognize the CRPD and the importance of the rights that are outlined within it. If you would like to learn more about the Convention, please visit our free webinar available on the NBACL website at [URL]. Paige Lagacy, Steve Lint, and Maggie Ready are students in the Social Work program at St. Thomas University. They are currently completing their final work term with the New Brunswick Association for Community Living.